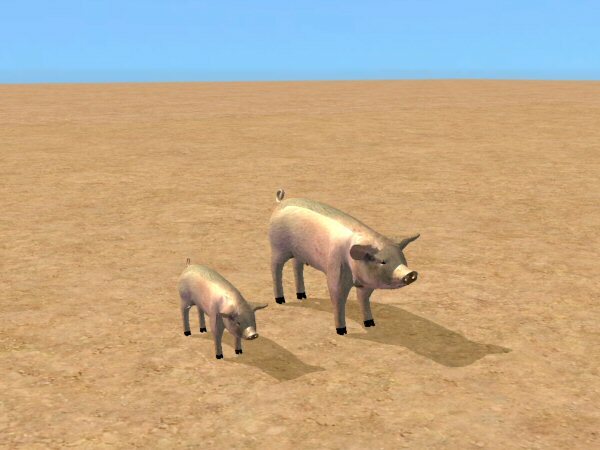 January 10, 2008 - Updated the ride able option of the Calf, I've added an option to allow children to pet the calf. 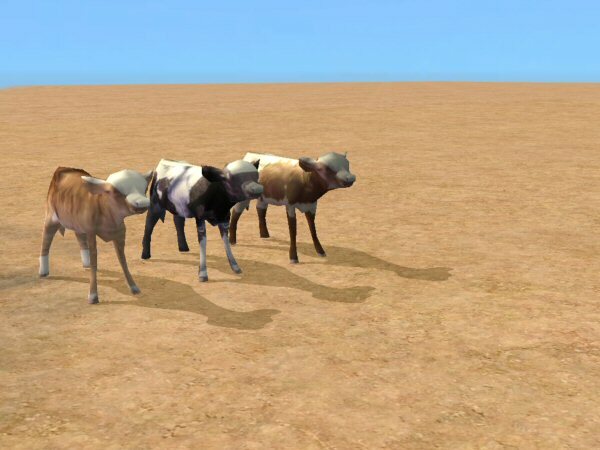 I've spent days tring to get the animations for the calf to not have the glide appearance but I'm not able to get it perfect. I've given the child more animation for the ride, and added a graze option. 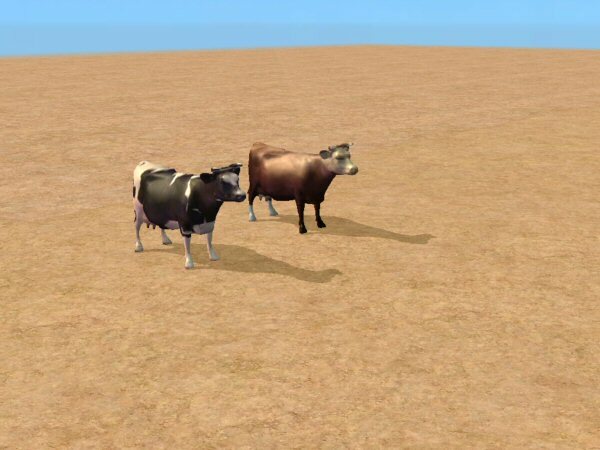 January 5, 2008 - Updated the ride able option of the Cow and added a new graze option. The animations still have a bit of a glide look to them but I think some of you will like it better. I've also recoded this portion to work smoother. Thanks to some suggestions from Echo. To create smooth animation is extremely hard and takes hours of work. I will try to update each of the animals as soon as time allows. Please note If you download the first version please overwrite the files, they all have the same file name. 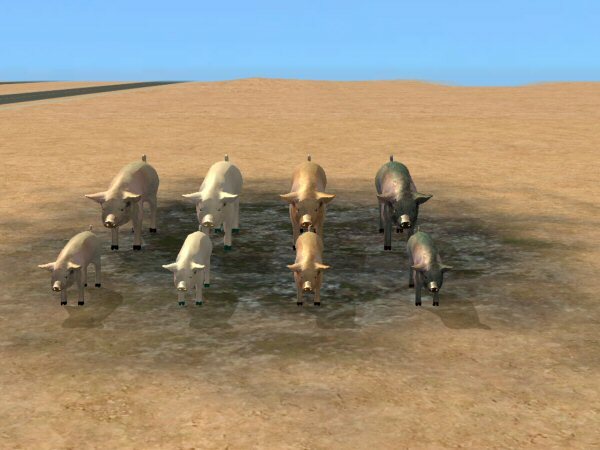 I have made changes to the CRES section so any current cows you have on the lot will have to be replaced. The heads will be out of proportion if you don't. The ride able option may require all EP’s. Some of the animals do have the base game controller and they should work for any EP’s combination. All items should work with the base game for using the animations and sounds. The ride able options are non autonomous, sounds and other animations are autonomous. Sims will sometimes sit sidesaddle or backwards. The Cow is ride able by adults and teens. The Calf is ride able by children. The Pig is ride able by children. The Piglet is ride able by toddlers. 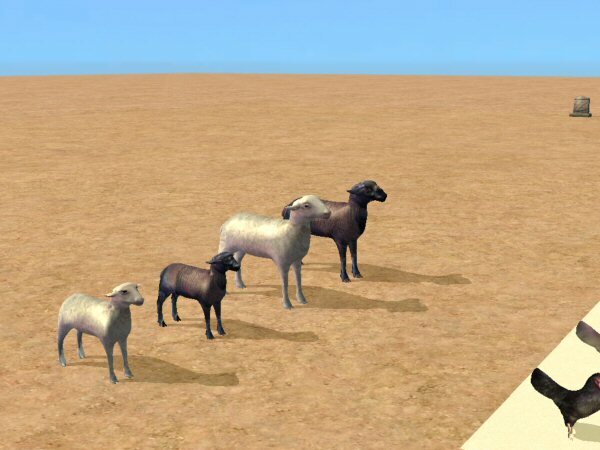 The Sheep is ride able by children. The Lamb is ride able by toddlers. 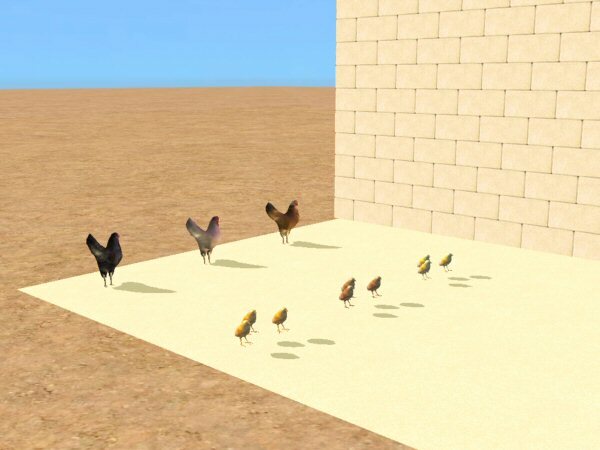 The Chicken and chicks - are not ride able but the chicken can be played with as a remote control item. Most meshes are re-meshes of meshes found on the unknown authors website, some are somewhat high in poly count. I tried to reduce them as much as I could. 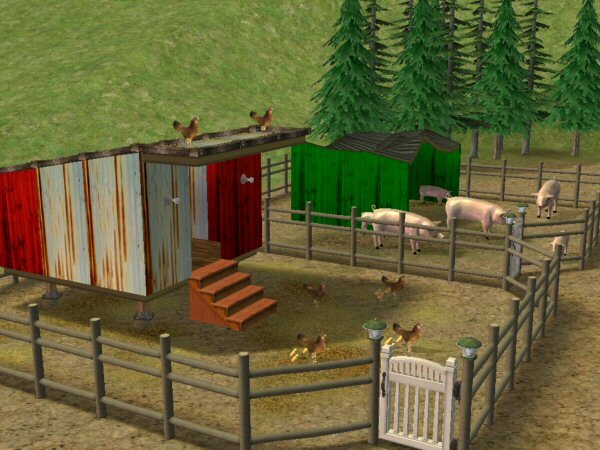 Puppetfish not only created a great house and barn he also included a pig sty and chicken coop, which all work great for all my animals. Thanks for permission to use your farm in my screen shots Puppetfish. The ride able portion is controlled by an NPC controller. The controller ages after time and may change the height of the item, if this happens You can re-download the item or save a copy of the controller in another area of your computer. If the Sims are riding the items when you exit the lot the items will disappear. The game automatically removes any NPC’s that are not household members. I try to update me items as I learn more so be sure to check back once in awhile. I am very new to creating animations please take this into consideration, these items took me a few weeks to create mainly building all the joints and getting them in the correct positions. There is not any tool available to help with setting these up. I have tried to get them as realistic as I could with the tools I have available. I have included the ride able option only because I intended to use the NPC controller for future updates. Please only consider the realistic look of the animals and the small animation with sound for the contest entry. 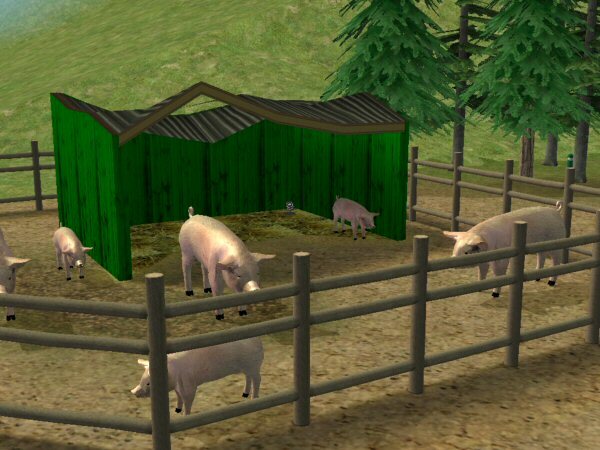 I know very few farm animals of this type are riden in real life and that is why I made this option non autonomous. I do know the ride able animations are not perfect and really should not have included this in my post.